A rejuvenating sequence for women who do too much. A wonderful practice to do when you don’t even feel like you have the energy to get on your mat. Therapeutic for the exhaustion commonly experienced by new mothers as well as for all ‘women who do too much’! As you do this nurturing, restorative practice to soothe those ragged edges remind yourself of the mantra so beautifully encapsulated in the book “Meditations for Women who do too much”: “As I love myself , it is only a short step to the loving of others”. Note, that timings are only approximate and suggested – stay in each pose for as little or as long as you feel. 12. 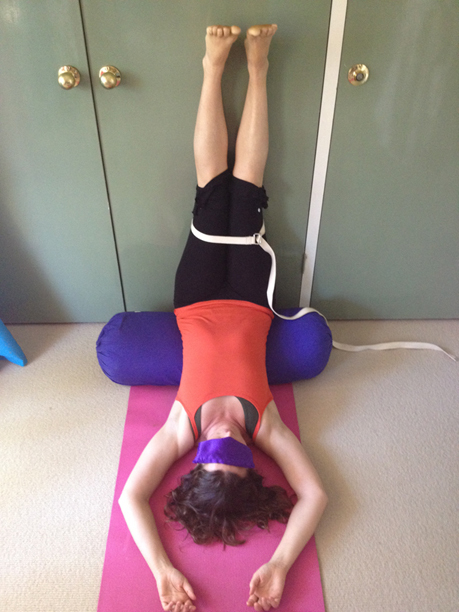 Savasana with double bolsters at the wall – 5 – 10 minutes. Imagine yourself in a beautiful forest – green, soothing colours – with a sparkling forest-pool and waterfall. Imagine that you dive into the pool and sit on a rock in the warming, soothing sun, underneath the waterfull, allowing the refreshing waters to cascade over your head and body. Feel washed clean, fresh and renewed. 13. Finish by sitting quietly for a minute or two – one hand on your heart and the other on your belly. And silently consider this mantra, from “Medititations for Women who do too much” – “I will sit with this feeling of being enough and let it be with me today.” Auummm. 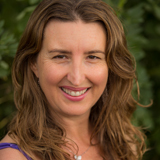 Ana Davis, Founder and Director of Bliss Baby Yoga, has a passion for a feminine approach to yoga, and supporting women with yoga through all ages and stages of their life. 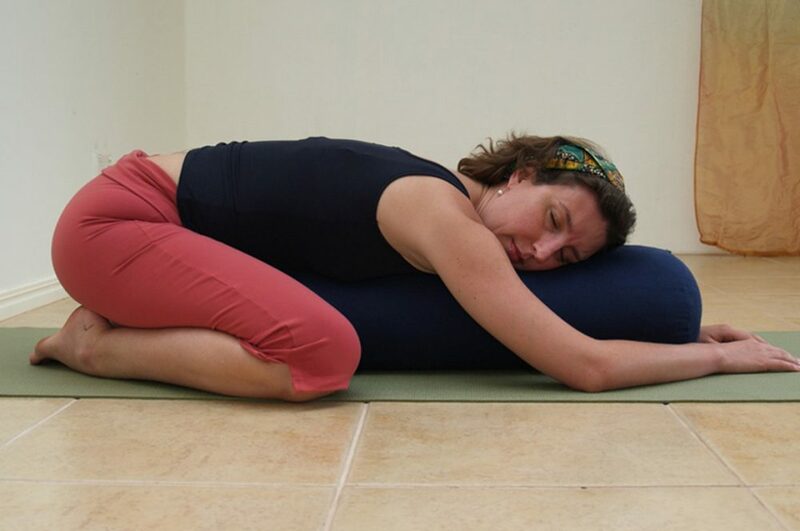 Ana is the lead presenter for the Bliss Baby Yoga Online L1 Restorative Yoga Teacher Training course, which offers beneficial and nourishing practices to assist in restoring the nervous system during stages of depletion and exhaustion. Ana’s first book, “Moving with the Moon – nurturing yoga, movement and meditation for every phase of your menstrual cycle and beyond” was released in October 2018. Ana also offers 1:1 Online Mentoring Sessions for yoga teachers and Personalised Online Yoga Classes to support women in their teaching and/or their personal yoga practice – with sensitivity and awareness of the unique stages of a woman’s life and monthly cycles.